Ancient ruins and archaeological remains, fresh handmade pizza and pasta over candlelight, world renowned masterpieces and works of art on canvas and in sculpture. Rome is Italy’s captivating capital and largest city. The Eternal City. Rome’s intriguing past is filled with thousands of years of history and culture. From the contesting Roman gladiators fighting to the death at the Colosseum, to the former standing temples and burial grounds in the ancient ruins of the Roman Forum, to legendary world-renowned artwork by masters like Michelangelo and Caravaggio - a walk through Rome is a step back in time. In contrast, Rome is also a modern city. Sit down and enjoy the traditional local wine and pizza or pasta. No trip to Rome is complete without an evening stroll and gelato in hand. Wander through this charming town and discover la dolce vita. Travelling to Rome? Fly direct into Rome from Toronto or Montreal nonstop (an eight-hour flight), or stop through a city or two like London and Paris to add more epic to your Europe adventure. If you’re flying out of another Canadian city, we can add on a connecting flight for you. We have plenty of options for you to choose from, so however you want to experience your Rome vacation, we can help you get there. Enquire online for more details (see above), over the phone at 1-877-967-5302, or visit us at your nearest Flight Centre store. Spring and fall are the best times to visit; temperatures are mild and days are sunny and long. 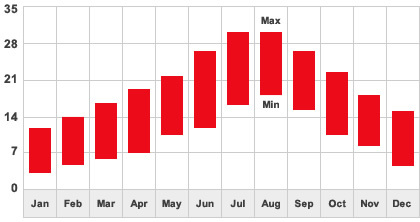 July and August are the hottest months of the year. Locals are more likely to be indoors than in the afternoon heat until the evening when temperatures cool down, perfect weather to enjoy a glass of wine in a trattoria or enoteca. Winter temperatures remain pleasant. There are only a few really cold days between December and January (temperatures rarely drop below zero degrees celsius). From November to February, expect rainfalls which are seldom heavy. 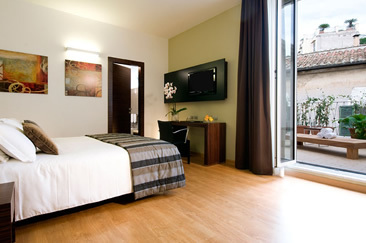 Plan your Rome travel for the seasons that suit you best. In this city of churches, none can hold a candle to St Peter's Basilica as well as its museums. Rome’s great gladiatorial arena is the most thrilling of the city's ancient sights. Even the cuisine is an art: traditional recipes, wine, street food and of course, pizza. A 2000-year-old temple, now a church, it is the best preserved of Rome’s ancient monuments. The tradition is to toss a coin into the water to ensure that you'll return to Rome.